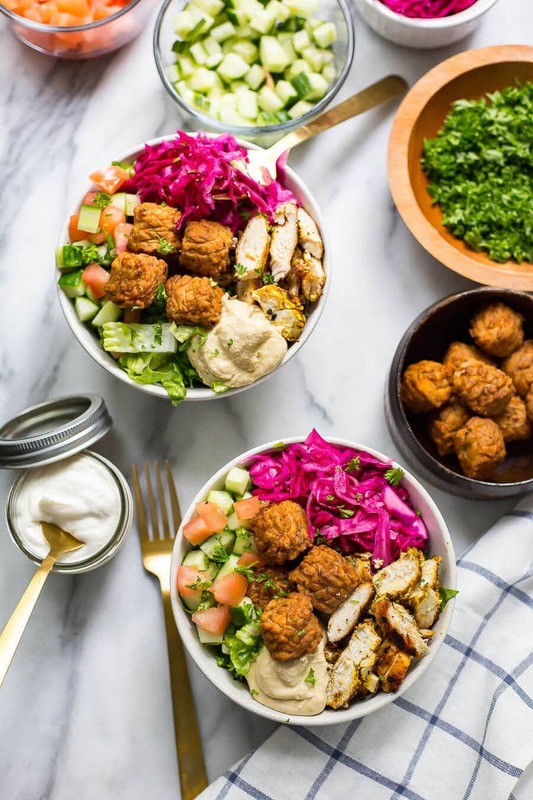 These Chicken Falafel Buddha Bowls are a healthy dinner idea that can double as your weekly meal prep – they're low carb, and loaded with veggies, hummus and garlic sauce! Say hi to my new fave buddha bowl! 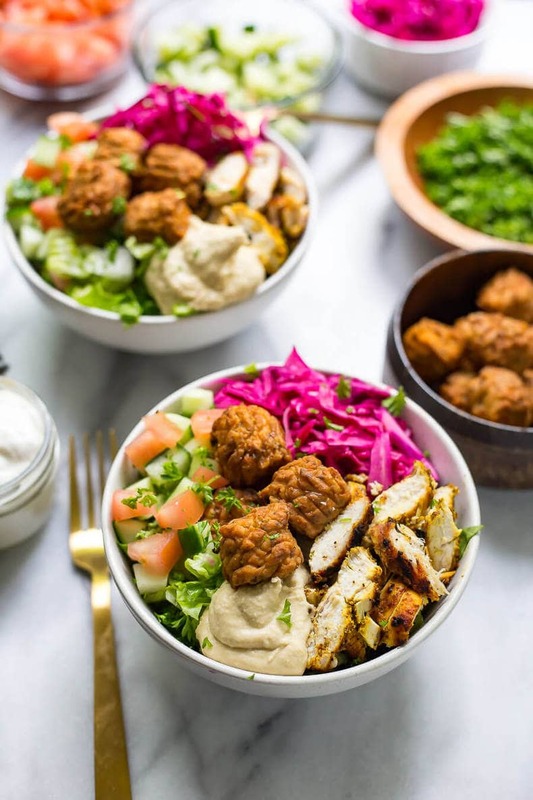 These Chicken Falafel Buddha Bowls are such a delicious, vibrant, colourful lunch or dinner idea that are sure to impress! Craving takeout from your favourite Mediterranean place? Look no further, because I've got you covered on the cheap, and these bowls can be made ahead of time for your weekly lunch prep. What a win-win. There are all kinds of delicious textures and flavours in here and these bowls are PACKED with veggies. I mean, they're kinda like a glorified salad in a way. But filled with protein and low carb – my fave! 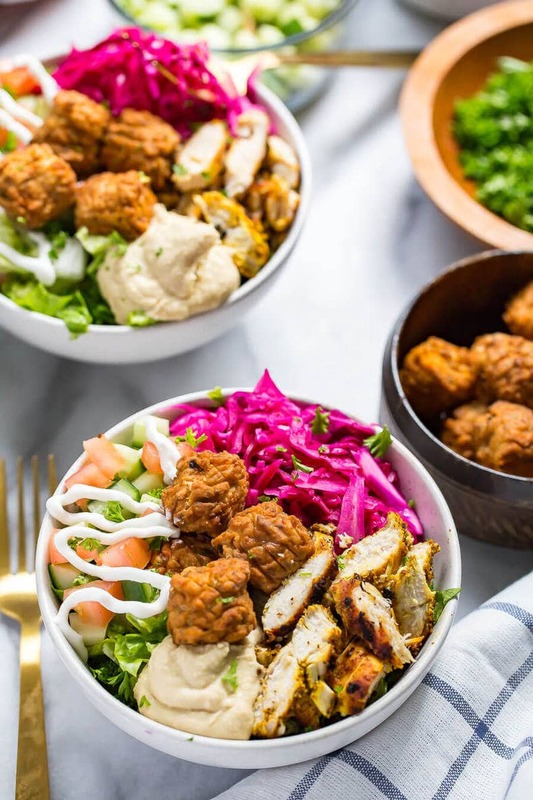 I really should be calling these Chicken Falafel Buddha Bowls energy bowls because they've got all kinds of wholesome, nutritious ingredients designed to help you maintain a healthy lifestyle. Then in your mid-twenties, if you're like me anyway LOL, you have somewhat of a young person's crisis and realize that your body changes with age, and it changes FAST. 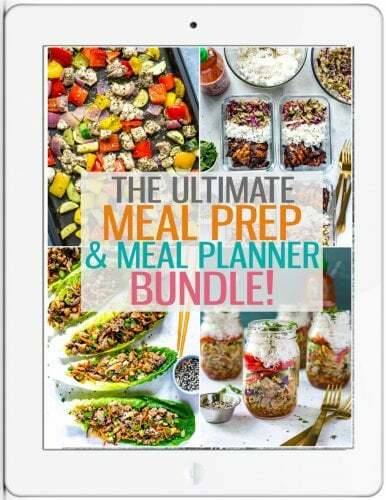 I basically started this blog for my love of cooking, but also because I realized that I desperately needed to meal prep in order to start eating healthier. I needed to have a plan in place. More young people in my generation than ever I think are recognizing the benefits of taking care of your body sooner rather than later, and that all begins with food. But I know the same old sweet potato and chicken meal prep combos get old over time. And honestly, for good reason. You work out hard, you wanna eat well and feel on top of your game all day, but you also want to look forward to a delicious lunch or dinner at the end of the day that you can feel good about. 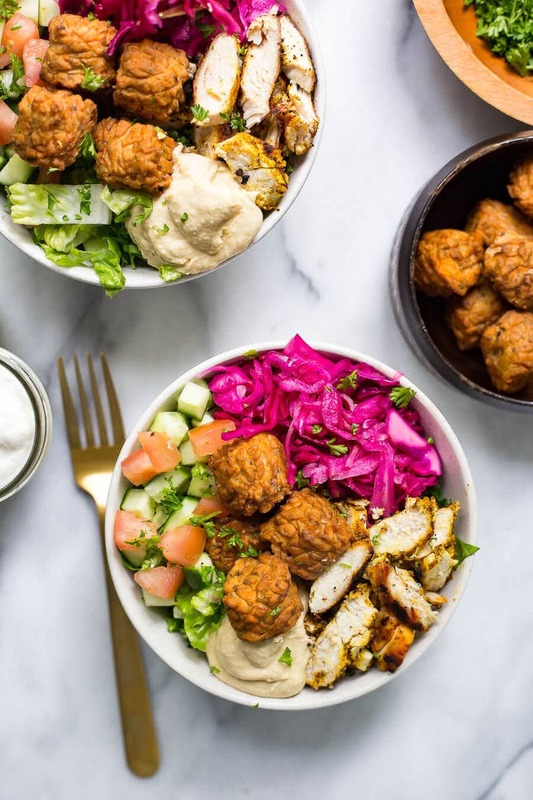 Well, I've got you covered with these Chicken Falafel Buddha Bowls. 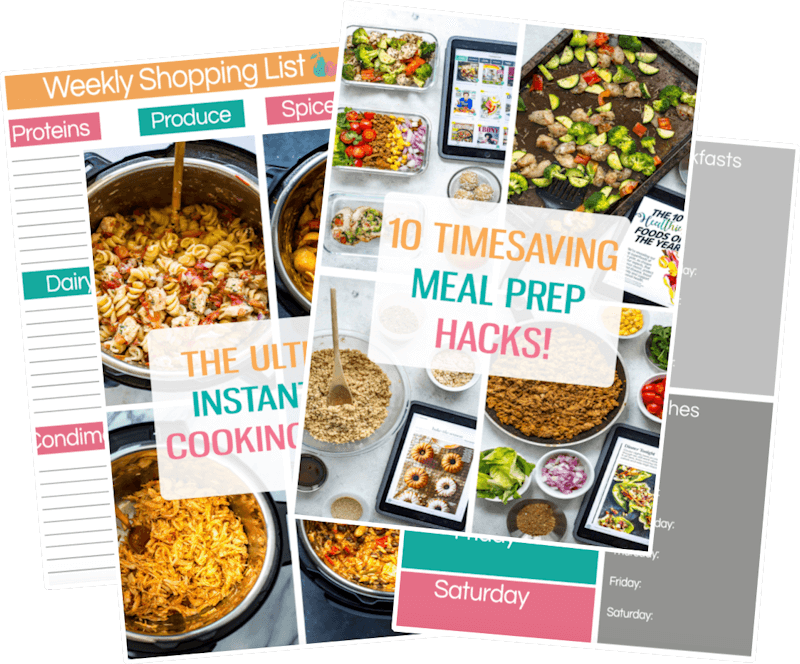 They're the perfect way to switch up your weekly meal prep, and four or five bowls come together in under an hour so you don't have to spend all your time in the kitchen. I made these this week and gobbled them down for lunch and dinner one day, and my little brother was apparently the envy of his co-workers when he brought his colourful bowls in. I swear, there is nothing garlic sauce or hummus can't fix in life. The sauces really are what make these bowls, and I've cheated a little bit in the process. 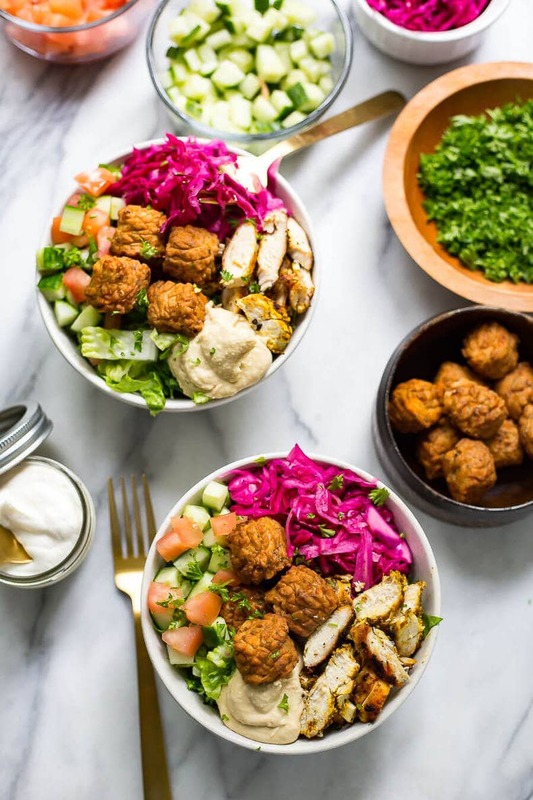 For starters, I bought premade falafels in store because I am NOT about to go through the process of making homemade baked ones like I did for this other Falafel Salad recipe I put out a couple years ago. My, how my cooking style has changed! I know you might be wondering why I even call this a recipe if I have taken so many shortcuts and honestly, I say life is too short to make everything completely from scratch. Sure, you have those days when you feel like experimenting and making something new and that's all fine and dandy if you have a ton of free time. But me? As long as the shortcuts are fairly healthy, I'm all for it. You could buy frozen falafels from the grocery store and bake them in the oven, but I prefer to use the precooked ones from the fresh section of the grocery store, where all the salad dressings are. For this recipe, I used the Yves sweet potato falafels (no, this isn't a sponsored post I just genuinely like their falafels!) and they were a fast and easy addition to these bowls. You've already gotta make the chicken and garlic sauce from scratch. From here on out, it's storebought pickled cabbage, falafels and hummus. But I did include a homemade quick pickled cabbage recipe if you're interested. It's actually so quick and easy you might just bypass the jarred stuff. 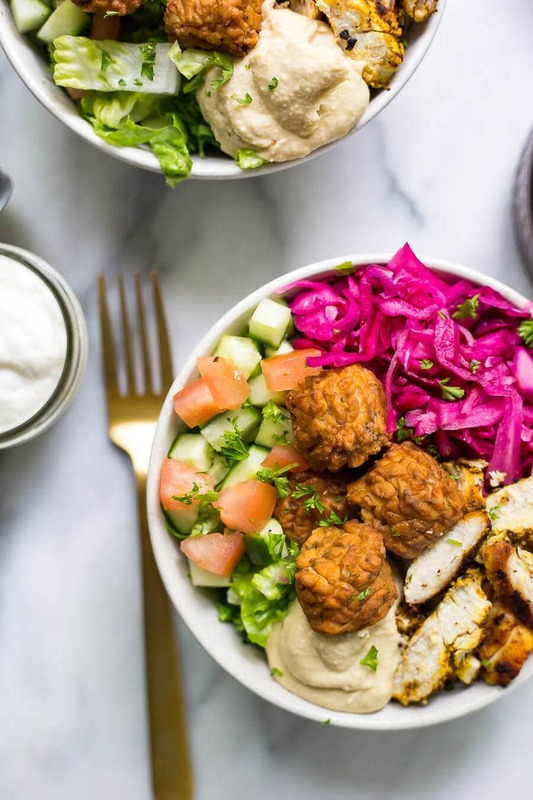 Will you be making these Fun & Easy Chicken Falafel Buddha Bowls? Seriously, I'm going to see how many times I can take a buddha bowl and reinvent it. There's just something about healthy bowl ideas that drive me crazy – they're like a super tasty spin on a salad with just about ALL the sauces! Gimme! 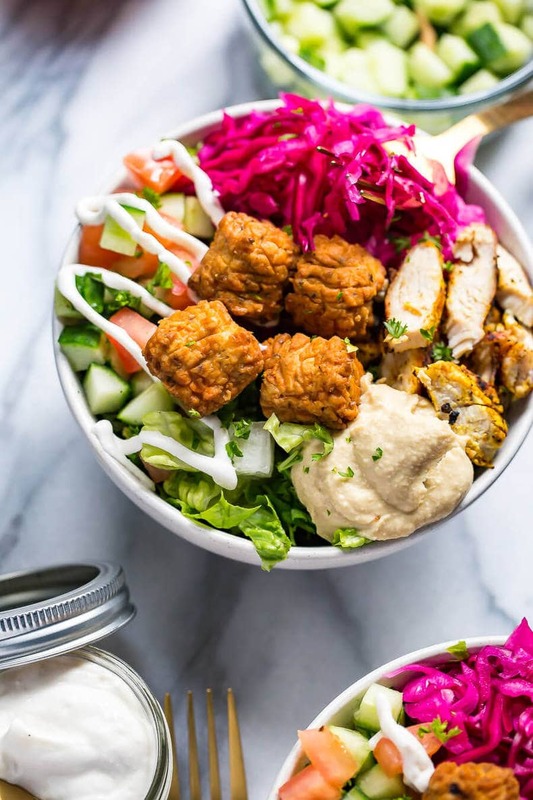 These Chicken Falafel Buddha Bowls are a healthy dinner idea that can double as your weekly meal prep - they're low carb, and loaded with veggies, hummus and garlic sauce! In a large bowl, mix together vinegar, sugar and salt until completely dissolved. Immerse cabbage in mixture, and let sit at least 30 minutes before serving. Cut chicken breasts in half lengthwise. Marinate all ingredients for chicken shawarma together in a large plastic bag. Let sit at least 10-15 min. Preheat BBQ to med-high heat and grill chicken for 5-6 min per side until chicken is cooked through. Alternatively, cook in a 400 F oven for 12-15 min until cooked through. Let cool then slice up. Meanwhile, blend all ingredients for vegan garlic mayo together in a Magic Bullet, blender or food processor. Sauce should only take 10-15 seconds on high to emulsify and thicken up. 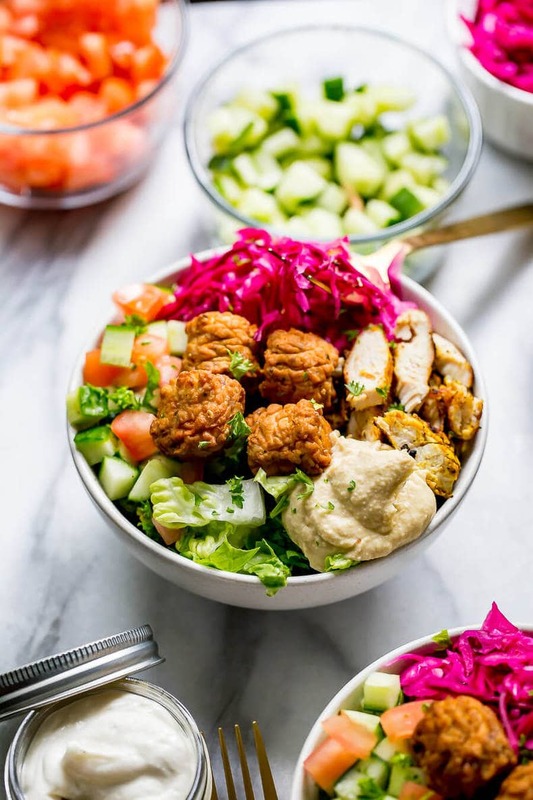 Add lettuce to each bowl, along with tomatoes, cucumber, parsley, pickled cabbage, falafels and sliced chicken. Add some hummus and garlic sauce to each bowl. Serve and enjoy!